Get Started with Jungle Scout! Welcome to the latest Jungle Scout project, where we will be bringing you the most transparent and up-to-date content about selling on Amazon for #freedombuilders! 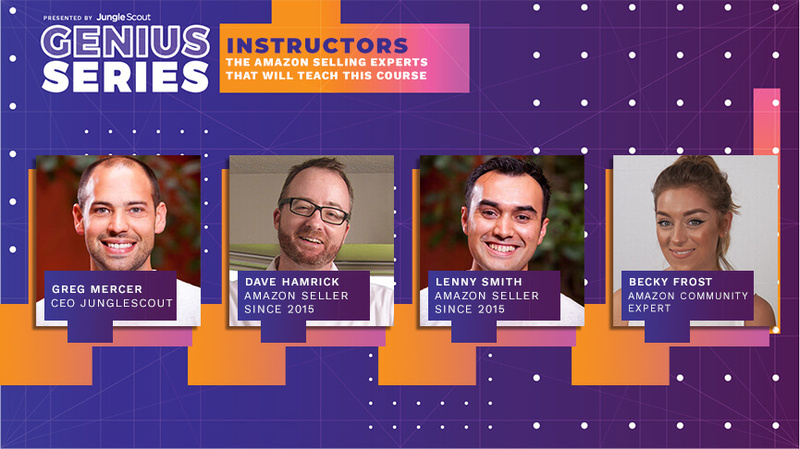 The Genius Series is a free in-depth guide where some of the top Amazon minds will teach you how to effectively sell your own private label products on Amazon, and it’s completely guided by YOU, the Amazon selling community! You spoke, we listened, and here we are to present an all star series for 2018. In addition to these four, there will be guest spots from some of the top names in the industry. Stay tuned for details! On our quest to build the perfect “how to sell on Amazon” series, we surveyed over 1,000 Amazon sellers. Some were experienced sellers, others were new sellers, and many were just getting started. With this valuable information, we learned what some of the biggest challenges that old and new Amazon sellers alike face in the fast evolving marketplace. Trying to find the perfect product? It’s super easy with the right strategy! We’ll teach you how we find all of our top-selling products. 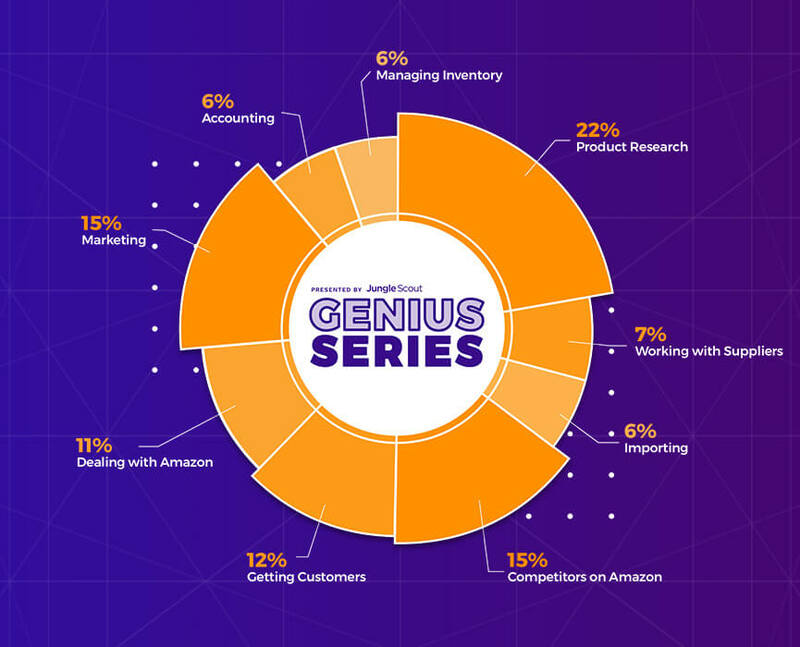 Our Genius Series survey showed that the biggest challenge new (and old) Amazon sellers face is finding the right product. Therefore, we will spend a great deal of time on this topic to ensure that you have the necessary tools, skills, and knowledge to find lucrative products that best suit you and your business. January 31st – Product Hunting 101. Our experts will demonstrate how they find profitable products to sell on Amazon. February 7th – What Not To Do. Next up, our experts will show you the “don’t dos” of product hunting and research that will help you steer clear of common pitfalls. February 14th – Valentine’s Edition or Finding a Product Your Customers Will LOVE. In the third week, our expert instructors will teach you a variety of product hunting strategies. February 21st – How to Raise Funds for a Product. Many of you have shared with us that you were concerned about the costs for starting a product. February 28th – Product Hunting Question and Answer Session with Greg Mercer. Jungle Scout Founder/CEO and successful Amazon seller Greg Mercer will answer your questions live. Effective marketing is the key to your product’s success! We’ll show you how the best do it. The next thing our Genius Series taught us was that many of you are interested in learning new and better marketing techniques. Whether it’s Amazon PPC, product photography, or branding, we dug deep to provide only the best information available. March 7th – Marketing Your Product 101. We cover the how, what, and why of marketing, and why it’s important to understand how to effectively promote your goods and services on Amazon and elsewhere. March 14th – Branding, Design, and Product Photography. Next, we will offer up some of our favorite skills and hacks for creating an innovative, one-of-a-kind product that will make your competitors jealous. March 21st – Amazon Pay-Per-Click Advertising Methods. Amazon PPC is a powerful way to get your product in front of millions of potential customers. And the best part? It’s super easy to use! This week we will teach you how to become an Amazon PPC master. March 28th – Advanced Marketing Techniques. Not a writer? No worries. This week, we will teach you how to write the perfect listing and how to stay in touch with your customers. April 4th – Marketing Question and Answer Session. Jungle Scout Founder/CEO and successful Amazon seller Greg Mercer will answer your questions live. Tired of those pesky competitors? Don’t let them get you down! We’ll teach you how to get around hijackers and manage competition. Our Genius Series survey told us that many of you are considered about competitors and the growing private label marketplace. That’s why in our third month, we’re giving you all the tools necessary to overcome your competition. April 11th – Managing Competition 101. Competitors can be tricky, but they don’t have to be scary. This week we will introduce you to the basics of overcoming competitors and what you proactive steps you can take to keep your products and your market share safe. April 18th – The Importance of A/B Testing. Studies show that A/B testing–where you test your products with different prices to segments of the same audience–can increase your profits as much as 40%. We teach you how easy it is to do this. April 25th – Handling Hijackers. A hijacker is another seller who jumps on your product’s listing and undercuts your prices. Here we will teach you preventive measures and strategies to help you avoid these parasitical sellers. May 2nd – Competitors Question and Answer Session. Jungle Scout Founder/CEO and successful Amazon seller Greg Mercer will answer your questions live. Time to find someone to manufacture your product? Sourcing doesn’t have to be scary! We’ll show you the ropes of effective product sourcing and importing. Finally, our Genius Series survey told us that many of you had questions about sourcing and importing your products. In our fourth month, we will go over the best protocols for finding reliable, trustworthy vendors . May 9th – Suppliers and Sourcing 101. Thanks to the internet, finding an overseas supplier and getting a great deal on bulk inventory has never been easier. We teach you the best way to discover, contact, negotiate, purchase, and import goods from other countries. May 16th – Communicating With Suppliers. For many, it can be overwhelming to communicate with someone who is on the other side of the globe. We make it simple for you, and offer some of our best tips, tricks, and tactics for efficient communication with overseas suppliers. May 23rd – How to Import. This week, we will go over the things you should know about importing goods from other countries. May 30th – Shipping Goods. Next, we will explain the different types of shipping methods, how freight forwarders and logistics companies work, costs, and more. June 6th – Sourcing Question and Answer Session. Jungle Scout Founder/CEO and successful Amazon seller Greg Mercer will answer your questions live. How to become a selling Genius! We’re pumped to get this thing going and as always, we aim to publish the best free Amazon selling content that can be found on the internet, as a way to give back to the community. You can head over to the Genius Series page below, and sign up to get the latest updates on when new sessions are coming up. Some of the sessions will be live, so we’ll be sure to let you know ahead of time. How is the continuity of these Genius Series? so I just relied on the blogs to get more training. I’ve tried signing up twice now, but no confirmation email the second time. The first time in Feb I got an email but that was the last I heard. I signed up for the Series last week, got the confirmation email, but couldn’t access anything further. Thought I’d wait and see—got no further emails and then on Feb.14 an email for Episode 4 arrived. Tried logging onto the site, but it doesn’t recognize me. I’m not getting the confirmation email. Are you still having problems with your email? I just checked the system and it looks like you were sent the Genius Series confirmation email already. You are enrolled as a Genius Series participant. Please check your promotions / spam for this email. If you can’t find it, let me know or contact [email protected]. I just checked and you are enrolled as a Genius Series participant now. You were already on our mailing list so the confirmation email should have been an introduction to the Genius Series. According to our systems this was sent on: 01/23/2018 at 03:59. Hopefully you have received it by now. Check your promotions and spam folders too! I’m not getting the confirmation email. Please enroll me. At what time will the sessions start and how long will they be, also if I miss a session can I catch up and how. Not every update will be live, but when we are running live sessions, we will let you know. You just need to sign up for the series using the links provided to get the latest updates. All of the content (live sessions, videos, articles and more) will be hosted on the Jungle Scout website, so you will always be able to find and catch up with the latest content. Yeah I have tried the sign up a couple of times as well. No email shows up to confirm. I think our email provider had a little bit of downtime. Could you enter your email address again? 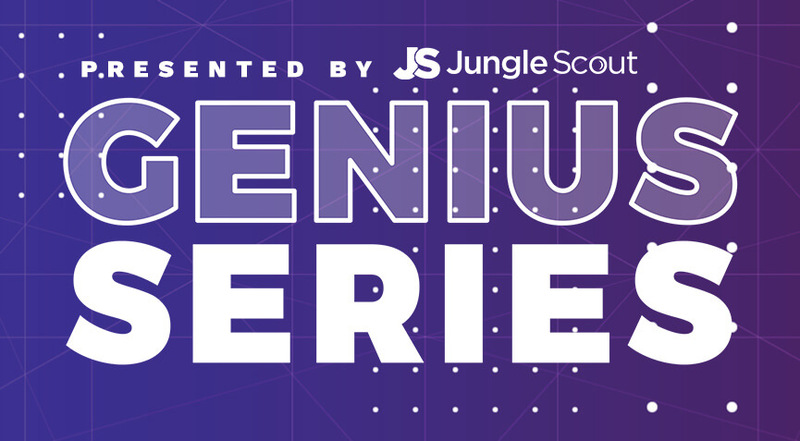 You should not need to confirm your email address as you are already on our mailing list, but you should receive a confirmation and intro to the Genius Series in your inbox shortly after you sign up. If the problem persists please contact [email protected] and we’ll get it fixed. Or respond to this comment and I can ensure you’re enrolled for the Genius Series! I try to sign up for the Genius Series. I get a message saying that I need to confirm my email address but I don’t receive any email. Sorry about that – you shouldn’t need to confirm your email address for this, but you should get a confirmation email address to let you know that you are in. I think our email system had some down time. Could you try again and if you still haven’t received the welcome email for the Genius Series you can contact [email protected] and we’ll make sure you get added to the list. Many thanks & sorry for the confusion! I signed up for your Top Product Trends for 2018 and never received the email so I have no access! I just took a look into this and it appears to be functioning fine. Could you try again, and this time be sure to check your spam and other folders, if you are new to our mailing list sometimes the initial emails can get lost. If the problem persists please contact us at [email protected] and we can send you the resource and troubleshoot the issue.